The West Virginia teachers have shown us all what it takes to win a strike — and what it will take to defeat Janus and expand our labor movement. After nine days on strike, the governor and state legislature caved, granting the teachers and school staff their main demand: the 5% wage increase (an increase that will cover all state employees, as well). After a West Virginia senator announced the agreement, there was some initial concern that the agreement had included language tying the 5% pay increase to $20 million in cuts in social services and Medicaid. Teachers and school staff interviewed immediately after the announcement said they did not want to be pitted against the poorest of the poor in West Virginia. But it soon became apparent that all the state Republicans’ talk about “fiscal responsibility” was little more than an attempt to save face. There was no wording in the agreement that ties the pay increase to cuts. This does not mean, however, that the state officials will not try to try to impose these cuts to pay for the pay raise. You can be sure they will try! “At this point the teachers and school staff have all the momentum, and they can fight to make sure the funds for this raise come from the rich, not working people, when the budget is eventually passed. We agree fully. — The Edit. Bd. West Virginia Teachers Point the Way Forward! 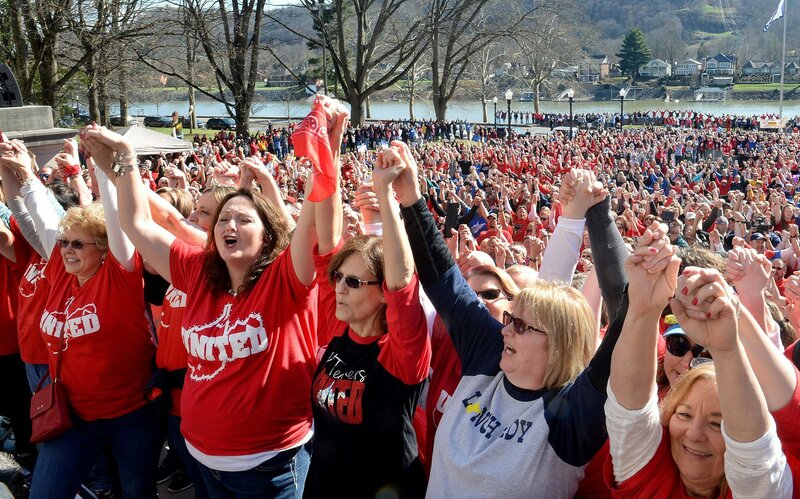 West Virginia teachers showed what real union power can do, even in a right-to-work (for less) state. During their nine-day strike, they rocked the state of West Virginia and the entire nation. Now teachers in Oklahoma, Kentucky, Arizona, and New Jersey — taking their cue from the West Virginia strikers — are talking about organizing walkouts and strikes to push their demands. It began Feb. 2, when teachers and school staff in four of the 55 school districts in West Virginia walked off the job for one day to demand a 5% pay raise and a “fix” to their healthcare insurance plan: the Public Employees Insurance Agency, or PEIA. Their action made waves and convinced teachers and staff throughout West Virginia that they could do the same. Perhaps this time it could be a two-day walkout. At first the three unions representing educators and staff — AFT-WV, WVEA and WVSSPA — warned that a statewide walkout would be ruled illegal and could provoke a costly backlash against the unions. But the teachers and staff were determined to strike, and they were united in their resolve. The union leaders heard the message from below and vowed to back the teachers and staff if they decided to strike. And so, on Feb. 22, the workers walked. Soon after the walkout, the unions staged a rally with AFT President Randi Weingarten and United Mineworkers President Cecil Roberts, among others. The teachers and staff welcomed the solidarity. The enthusiasm on the picket lines was huge, and public support was strong. The teachers had seen all too many state politicians betray their promises, so they rejected the back-to-work directive of the union officials. There were no rifts in the workers’ ranks. They were right not to go back. The state Senate refused to give them the 5%, voting instead a 4% increase. This only increased the unity and resolve of the teachers on the picket lines and in the state Capitol. Dale Lee, president of the West Virginia Education Association, echoing the united position of the rank-and-file, declared publicly that the teachers and staff would stay out indefinitely until the 5% was won. This stance by the union leadership only accentuated the crisis at the top levels of state government. The governor, a Republican, called on the strikers to stay out and not accept anything less than 5%. This was unprecedented — especially in a state where strikes are banned. Totally isolated, the Republican leadership of the state Senate had no choice but to cave. It was an historic victory, one that brought tears of joy to the eyes of all the strikers. Some union activists across the country are drawing the conclusion that the NLRB and Wagner Act represent constraints that have irreparably hamstrung the unions. They are asking out loud if the traditional union movement is up to the task. These are legitimate questions; the institutional framework of labor relations has surely nourished Business Unionism. The real lesson, however, of West Virginia is not that unions are no longer the vehicle needed to advance workers’ struggles. No, unions are needed more than ever! The lesson is that the rank-and-file have the power — and, if harnessed, that power can overcome what appear to be insurmountable obstacles. The lesson is that to win, democratic control of the unions from the bottom up is needed, with restored bargaining rights and local control over bargaining. The lesson is that right-to-work laws must be repealed. In a nutshell, unions are the self-defense organization of workers. What is needed is to reclaim the unions for ongoing struggle. Labor Movement Needs to Walk the Walk! Speaking to hundreds of striking teachers on a picket line in West Virginia on Feb. 26, the very day the Supreme Court was hearing the Janus v. AFSCME case, Randi Weingarten, president of the 1.5-million-member American Federation of Teachers (AFT), stressed the point that working people need to rely on themselves, and not “outsource their power to others,” if they are to win their demands. These words ring true: For far too long, unions have “outsourced” their power to politicians who claim to be friends of labor but who, as workers soon learn, have much better friends in the corporate boardrooms. “We have to do it ourselves” can only mean relying on the independent power of labor and its community allies — not on the politicians in the Democratic Party, who are funded by the very same corporations that fund the Republicans. But words are not enough; the labor movement needs to walk the walk, not just talk the talk. So what will it take for this AFL-CIO resolution to become a call to unleash labor’s potential power in response to the unprecedented assault by the bosses and the politicians in their pay? First thing, the teachers’ unions and the entire labor movement — in the aftermath of the victorious teachers’ strike in West Virginia — need to mobilize support for teachers planning strikes in Oklahoma, Arizona, New Jersey and Kentucky. These teachers are on the front lines of the struggle for workers’ rights. That is not all. Labor is under attack like never before. The Supreme Court’s Janus v. AFSCME case, which would eliminate agency fee, represents a gun pointed at the temple of the labor movement. The bosses want to gut labor’s numbers and their collective strength. A federal “right-to-work” law looms closely behind Janus. Actions to protest the Supreme Court’s expected decision in support of Janus were held across the country on Feb. 26. But they were small, scattered — and they were not backed by a unified labor movement. This is not going to turn the Supreme Court around. The AFT is one of the unions calling on all its affiliates to reconnect with their members and promote “bargaining for the common good” — which means putting forward demands that benefit the entire working class, and not just the educators: fight for $15 and a union, massive job-creation plan, tax the rich, no more deportations, affordable housing for all, single-payer healthcare, etc. Stop Janus in its Tracks! Yes, the trade unions will need to reach back to their independent, fightback origins if they are to prevail in this fight against the corporate juggernaut. It is not enough to prepare the unions for the post-Janus era, important though that may be. The time is now to stop Janus in its tracks. It is not too late to do so. The leadership of the International Longshore and Warehouse Union (ILWU) has voted to shut down all 29 West Coast ports on Tuesday, May 1st, to demand labor rights, and it is calling on the entire labor movement to follow suit. 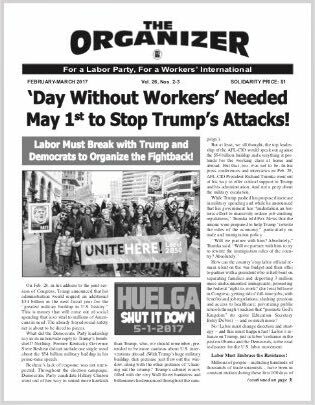 Isn’t it time for labor and its community partners to pull out all stops and mobilize their members in a National Solidarity Day For Labor Rights and Immigrant Rights on May 1st? 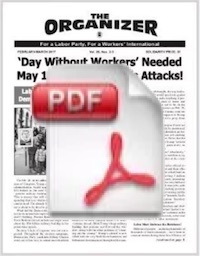 The immigrant rights movement, with its massive mobilization of more than 6 million people on May 1, 2006, reclaimed May Day for immigrant workers. Now is the time for the labor movement to reclaim May Day for all working people and the oppressed. The labor movement needs to flex its muscle. It needs to speak — and act — with an “unquestionably independent political voice.”— Edit. Bd.